As intimidating as caring for three newborn babies at once may be, feel confident in the fact that many mothers have done it and it is possible. In the early days, the hospital staff and your pediatrician will assist you in getting you and your babies on a schedule. They can instruct you as needed and help you find what works best for you. 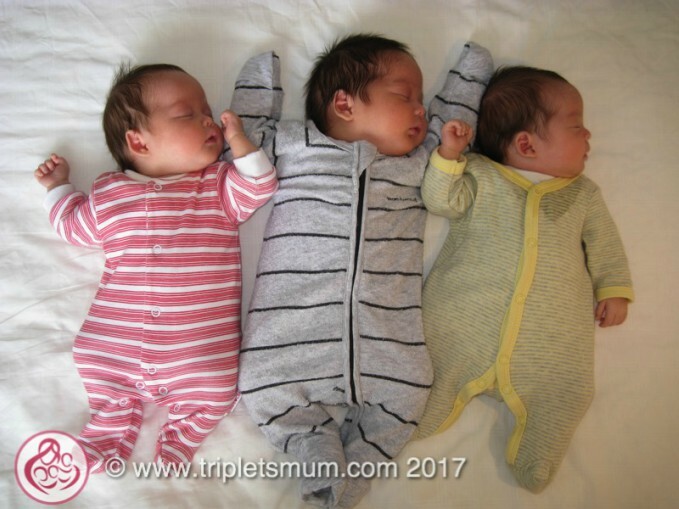 Breastfeeding triplets is completely possible and many moms have done it successfully. Bottle feeding is also an option if that is your decision. Whichever route you choose comes with it’s own set of benefits and challenges. Breastfeeding moms of multiples need a healthy diet rich in nutrients and adequate water intake. Enlist the help of family or friends to help you cook and prepare your food to make sure you eat well-balanced meals. Our bodies have amazing capabilities, so try not to be overly concerned with your milk supply if your babies are healthy and gaining weight. Premature babies may not have the sucking strength to feed from your breast, so you may need to pump your milk in order to stimulate your supply. There are different types of pumps so do some research early on in your pregnancy to find what will work for you. Remember, if you are breastfeeding, only you are able to do that job for your little ones. Anyone can do chores or other household tasks. Don’t wear yourself out trying to do it all yourself! If you have issues or concerns with breastfeeding or pumping, you can consult a lactation consultant. Some hospitals have one on staff that can help you once you deliver. La Leche League is another helpful resource for breastfeeding moms. Bottle feeding is another option for feeding your babies. The hospital staff should be able to help you learn positions and develop a routine. Always supervise your babies if you are prop feeding. You may find it helpful to use a feeding chart or feeding chart app to keep track of your triplets’ needs. Keep in mind that bottle feeding babies may need different brands or strengths of formula and the instructions may be different for each. Color coding bottles and clothing may be helpful to make sure everyone is getting what they need. No matter if you breastfeed or bottle feed, it’s important to feel comfortable in your choice and also flexible in case you need to adjust. After a few weeks, you may begin to develop a rhythm of caring for your triplets. For example, you may rotate the bathing schedule so you only bathe one baby per day. Your babies may become predictable in their feeding and diapering needs. However, don’t be alarmed when the schedule is disrupted by growth spurts, developmental leaps, or other changes in the environment. The challenge of caring for multiples is staying calm and making sure everyone is comfortable, including you! Don’t forget to take care of yourself and don’t be shy to ask for help. Caring for newborn triplets is a learning process. You will do just fine with the proper support from your family, friends, and healthcare providers. Not to mention support from other moms and especially moms of multiples! Leave a comment if you have any questions or ideas to share!